The Taber® Grit Feeder Attachment is used in conjunction with the Taber Rotary Platform Abraser (Abrader) to evaluate three-body abrasion caused by the destructive action of fine, hard particles. Originally referenced as the Frick-Taber test, this instrument has been used to determine the wear resistance of flooring products with smooth surfaces. The Grit Feeder is a freestanding instrument that requires a Taber Rotary Platform Abraser (not included) to conduct testing. The grit distributor nozzle is positioned over the Taber Abraser specimen in front of the right abrasive wheel. During the test, abrasive grit particles are deposited uniformly and continuously onto the specimen surface. As the specimen holder rotates, the loose grit particles pass under a pair of S-39 Leather-Clad Wheels. The resulting rolling action of the particles serves as the abradant and contributes to the physical breakdown of the material. The vacuum hose from the Taber Abraser is inserted into the base of the Grit Feeder allowing a pickup tube to be positioned such that grit particles and debris are removed. The operation of the grit feeder is controlled through the Taber Abraser, ensuring that the turntable, grit distribution and vacuum suction are actuated at the same time. IMPORTANT: Due to the type & quantity of abrasive media that is used during this testing, Taber recommends that you frequently inspect the vacuum filter and collection bag and replace when necessary. Two Grit Feeder models are available. Grit Feeder - Model 155 offers a hopper capacity of approximately 1,300 grams. Mounted on the left side of the Taber Abraser, Model 155 utilizes an alignment guide screw to set the position of the instrument. The grit distributor and vacuum removal nozzle heights are adjusted using a thumbscrew. Grit Feeder - Model 255 offers a hopper capacity of approximately 4,500 grams. An alignment block is incorporated into the base of the Model 255, to ensure the correct location of the grit feeder in relation to the abraser. A hand crank controls the telescoping feature allowing precise height adjustments and testing of thicker specimens (up to 40mm with the Taber Abraser Arm Height Extension Kit). With the ability to mount on either the right or left hand side, two instruments can be used in conjunction with Taber's dual Rotary Platform Abraser. 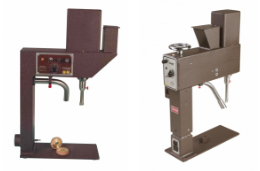 Note: To use older versions of the Taber Grit Feeder with Taber Abraser Model 5135 or 5155 equipped with the Grit Feeder Control Output connection, a Grit Feeder Control Box (sold separately) is required. The standardized abradant supplied with Taber's Grit Feeder is a #240 aluminum oxide grit particle (Model S-41). Produced specifically for Taber Industries, this aluminum oxide has tighter controls for both particle size analysis and bulk density properties compared to "off-the shelf" aluminum oxide. To calibrate the rate of flow and to measure the abrasive rate of the abradant, S-38 Standardization Plates are utilized. Prior to use, the abrasive grit should be screened through U.S. Standard Sieve No. 80 to break up any conglomerates and to remove any oversized or foreign particulate matter. Afterwards, dry the grit for 1 hour at approximately 82° C (180° F). Allow to cool in a temperature and humidity controlled room prior to use. To satisfy test method EN 14354 and ISO 24338 Method B, Alodur ESK 240 aluminum oxide grit should be used. Contact Taber Industries for additional information. Weight (Mass) Loss - The weight loss test method is a quantifiable method that records the weight loss of your test specimen due to abrasion. This method of evaluating test results is recommended when the results are to be compared with those of similar materials having nearly the same specific gravity. Weigh your test specimen before and after testing to obtain the initial and final weight values. The difference between these two values, Ftotal, is the weight loss. Taber Wear Index may also be used to present weight loss data. This measurement is the loss in weight in milligrams per thousand cycles of abrasion. The lower the wear index, the better the abrasion resistance quality of the material. Cycles to a Specific End Point - The number of cycles required to reach a predetermined end point (e.g. wear through to the substrate). Alternatively, this could be reported as the condition of the specimen after subjecting it to a specified number of cycles. According to test method EN 14254 (Wood based panels - Wood veneer floor covering Annex D Test method to determine the wear resistance), wear generated with the Taber Grit Feeder is evaluated using a transparent template with each quadrant divided into four sectors of 22.5°. The transparent template is placed on the test piece to determine if there is continuous wear in 12 sectors out of 16; and continuous wear through in 1 sector per quadrant. If there is not sufficient contrast between the substrate and coating, a contrast marking solution may be used (e.g. water based solution of 1% Methylene or Alkali blue). Volume Loss Method - In comparing the wear resistance of materials having different specific gravities, a correction for the specific gravity(s) of each material should be applied to the weight loss to give a true measure of the comparative wear resistance. The use of this correction factor gives a wear index related to the loss in volume of the material to which it is applied. Determine the specific gravity of the material to be tested in accordance with standard practice. If the specimen is not homogeneous, but possesses a surface that differs from the body or core, determine the specific gravity of the surface alone. If abrasion is to be carried beyond the surface of the body, also determine the specific gravity of the latter and calculate and report the abrasion resistance of the two components separately. Depth of Wear Method (Thickness) - Certain test requirements may call for measuring the depth of wear. To determine this, mark four points on the back of an unabraded sample, 90° apart and oriented 11/2" (38 mm) from the center hole [this will be within the wear path]. Using a thickness gage or micrometer, measure the specimen thickness. After abrading the sample, repeat the measurements and record the difference. To compensate for depth differences around the specimen wear path, an average should be computed from the four readings. Change in thickness can also be measured using an Optical Micrometer or similar instrument. Place the measuring device so that it spans both the abraded and unabraded portion of the specimen. Calculate the amount of wear by measuring the difference between the abraded and unabraded areas in four equadistant points around the specimen, and average the results. Alternatively, the average loss in thickness can be calculated by dividing the loss in volume by the abraded area of the specimen. 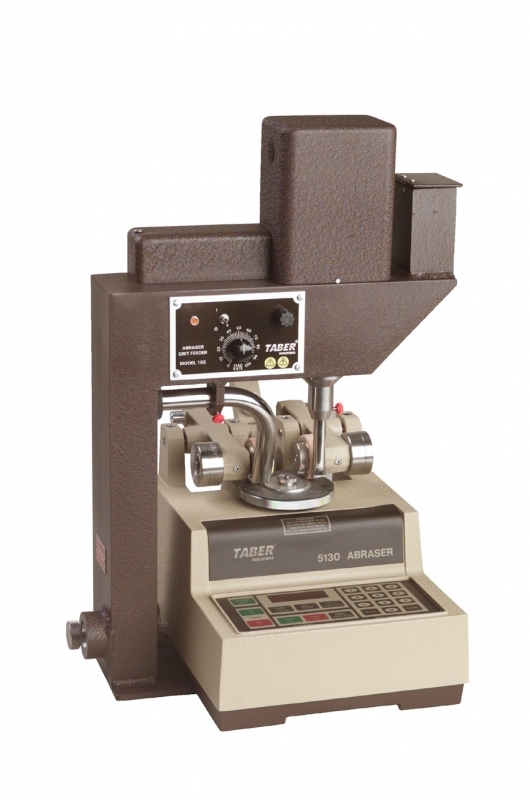 The following link provides a listing of test methods the Taber Abraser (Abrader) and Grit Feeder Attachment satisfies. Please note, additional accessories may be required.